MEASUREMENTS ARE AS FOLLOWS: From side to side, under the armpits. ONE SIDE MEASUREMENTS ONLY, NOT ALL THE WAY AROUND. These measurements are taken from the vest. 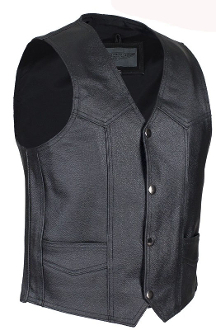 It is best to compare to a well fitting shirt, or vest for an exact fit. DO NOT MEASURE A PERSON. ONLY MEASURE WELL FITTING CLOTHING. ~ TOP TO BOTTOM = 17 inches layed flat. ~ TOP TO BOTTOM = 18 inches layed flat. ~ TOP TO BOTTOM = 18.5 inches layed flat. ~ TOP TO BOTTOM = 20 inches layed flat. ~ TOP TO BOTTOM = 21 inches layed flat. ~ TOP TO BOTTOM = 22 inches layed flat.